After Carl Cox recently announced his return to EXIT Festival, he was quickly joined by Paul Kalkbrenner, Amelie Lens, Maceo Plex, Jeff Mills, Charlotte de Witte, Boris Brejcha, Peggy Gou, Dax J, Monika Kruse, Adriatique, Satori, Johannes Brecht and many others. Now, this line will also have Solomun, an EXIT regular since 2010, bring his “+1” party from Ibiza! He will bring the spirit of the White Isle to the 18th century fortress with his special guests, Tale of Us! 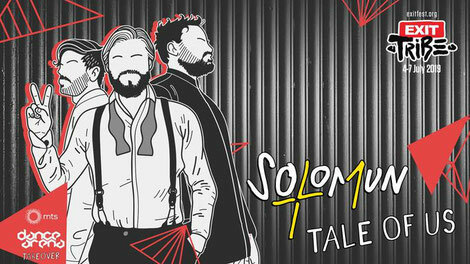 Their concept will takeover EXIT's stage for six hours, presenting Solomun and Tale of Us in their solo sets first and ending with a grand finale 2-hour b2b set. During each week of the four-month summer season on Ibiza, Solomun personally picks one guest to share the DJ stand with him at the Pacha club for the whole night. This party series has seen a list of guests including Sven Vath, Dixon, Black Coffee, DJ Tennis, and many other artists including Belgrade’s Vladimir Ivković. Karm and Mateo have been involved in the clubbing scene with tracks such as ‘Another Earth’, ‘Northern Star’, ‘Monument’, and one of the most popular labels in the past few years. His growing appeal happened, among other places, at EXIT Festival as far as 2010, when he played in the early morning hours. The winner of the DJ Award for the best melodic house and techno in 2018, he is the head of the Diynamic record label that recently celebrated its 100th release, and he’s also in one of the most popular video games GTA, alongside the Tale of Us.